During World War II, 120,000 American residents were sent to concentration camps not in Europe, Asia or some other distant place, but here in the United States. Over 8,000 of these men, women and children were interned in Utah. Their crime was their ancestry; their penalty was their loss of freedom. They were ethnic Japanese, more than 60% of whom were native-born American citizens, and who became victims of the wartime fears of their fellow Americans. 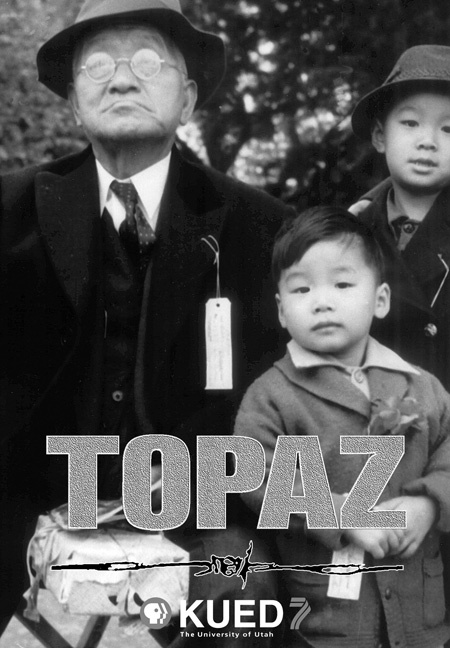 Topaz is the story of the thousands of San Francisco Bay Area Japanese who were separated from their property, livelihoods, and constitutional rights, and shipped to a windswept stretch of Utah's roughest rangeland. There, for more than three years, these men, women and children were forced to call row after row of tarpaper barracks "home." This was Topaz, a war relocation camp near Delta, Utah, which overnight became the fifth largest city in the state. The internees, surrounded by barbed wire and armed sentries, were never formally charged with a crime, and were never granted a trial. They were simply uprooted from their homes and shipped off in blacked-out trains. It was feared that, though most were American citizens, they would none-the-less be more likely to serve the Emperor of Japan than the cause of freedom in the United States. No evidence was ever presented to sustain the rumors of pending sabotage or disloyalty, but 'military necessity' became the foundation for one of the darkest wholesale actions against an ethnic minority in American history. Topaz examines Utah's unique role in the relocation program, and explores the atmosphere in Utah during this period. Through archival film and photographs, many never before broadcast, and through interviews with surviving internees and Utah camp workers, the years of imprisonment are brought to life from Utah's perspective. Topaz also provides deeply personal insights into the ironies of war relocation: the struggle of camp residents to find normality in their lives in the desert; what it meant to pledge allegiance to the flag of a country that considered you a subversive because of your ancestry; the pain of citizens trying to understand a democracy that apparently didn't apply to them; the loss suffered by parents whose sons died in Nisei battalions (American military units made up of Japanese American soldiers) while the parents remained housed behind barbed wire. Equally as relevant today as it was twenty years ago, Topaz examines the fragile balance between "rights" and "national security."